The University of Maryland Eastern Shore is a four-year, state-supported, coed, liberal arts institu…. The University of Maryland Eastern Shore is a four-year, state-supported, coed, liberal arts institution founded in 1886 as Princess Anne College by the Methodist Episcopal Church (MEC) to educate freed blacks. The original site purchased for the school was the historic Onley House, which was the former residence of prominent citizens of Princess Anne. UMES survived a difficult beginning, as Princess Anne citizens questioned the fact that freed blacks were allowed to receive an education and that the Onley House was being used for that purpose. Having founded the very successful Centenary Biblical Institute (now Morgan State University) in Baltimore in 1867, the Methodist Episcopal Church sought to establish another such school in its Delaware Conference, which included Princess Anne. Since the original purpose of the Centenary Biblical Institute was to educate black men as ministers, tradesmen, and teachers, the conferees thought to establish the new school in Princess Anne for black women. After some discussion and negotiation, the school was established as coed. In 1890, the passage of the Second Morrill Act established that Southern states having separate schools for blacks must provide institutions for them to study agriculture and technology. To that end, UMES became a land-grant institution. In 1948, the school was named Maryland State College, a Division of the University of Maryland. On July 1, 1970, Maryland State College became the University of Maryland Eastern Shore, and ten years later UMES became one of the eleven campuses of the newly formed University of Maryland System. UMES remains committed to providing higher education in the agricultural sciences to blacks. As a land-grant institution, it has expanded its mission to provide higher education for students from diverse backgrounds, across the state and nation, in a broad range of educational programs. The campus is situated on 700 acres, with Georgian, Colonial, and modern architectural-style buildings. Facilities include the Frederick Douglass Library and the Ella Fitzgerald Performing Arts Center, both named for notable African Americans; an art and technology center; a computer center; and a number of laboratories. New facilities include Kiah Hall, Bird Hall, and the Aquaculture Building. 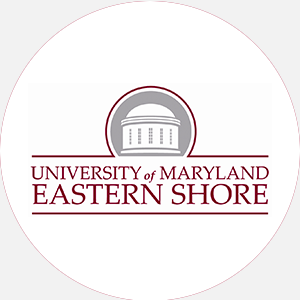 University of Maryland Eastern Shore is accredited by the Middle States Association of Colleges and Schools (MSA) to award the Bachelor of Arts, Bachelor of Science, master’s, and doctoral degrees. Percentage of students receiving financial aid: 90 Financial Aid Specific to the School Army ROTC offers two- and four-year scholarships that pay tuition, fees, books, and other expenses as well as provide a monthly stipend. Graduation from an accredited high school (or equivalent) and completion of the following units: 4 English, 3 mathematics (algebra I and II and geometry), 2 lab-based sciences, 3 social sciences, and 2 foreign language; submit official high school transcript, with minimum C average; recommendation from high school counselor; completed medical form by a physician. A nonrefundable application fee is required (may be waived for some students). Maryland residents are given priority by state law. A minimum of 120 credit hours and completion of the core requirements, including 3 credits in math, 7 credits in science, and a computer course for some majors; minimum 2.0 GPA; complete 1 credit hour in freshman planning; the last 30 hours must be in residence at UMES. Campus Regulations: Freshman orientation mandated; cars allowed with permits. Campus Services: Health center, personal and psychological counseling, career counseling and placement, student employment services, remediation and tutoring. Campus Activities: Social and cultural activities include theater and chorale. Students may get involved in the student-run newspaper and yearbook. Communication majors or volunteers can work on the student-run radio station. Leadership opportunities can be found in the Student Government Association (SGA) or international student groups, undergraduate student council, Caribbean International Club, Centennial Club, Collegiate Chapter of Future Farmers of America, Engineering Technology Society, Eta Rho Mu, Groove Phi Groove Social Fellowship, Human Ecology Club, Miaka Club, NAACP, National Student Business League, Panhellenic Council, Students for Progressive Action, Accounting Club, Student Construction Association, Wicomico Hall Men’s Association. Greek sororities include Alpha Kappa Alpha, Delta Sigma Theta, and Zeta Phi Beta; fraternities include Alpha Phi Alpha, Kappa Alpha Psi, Omega Psi Phi, and Phi Beta Sigma. Honor societies are also represented on campus. Housing Availability: 1,700 housing spaces, freshmen given priority. Handicapped Services: Wheelchair accessibility.